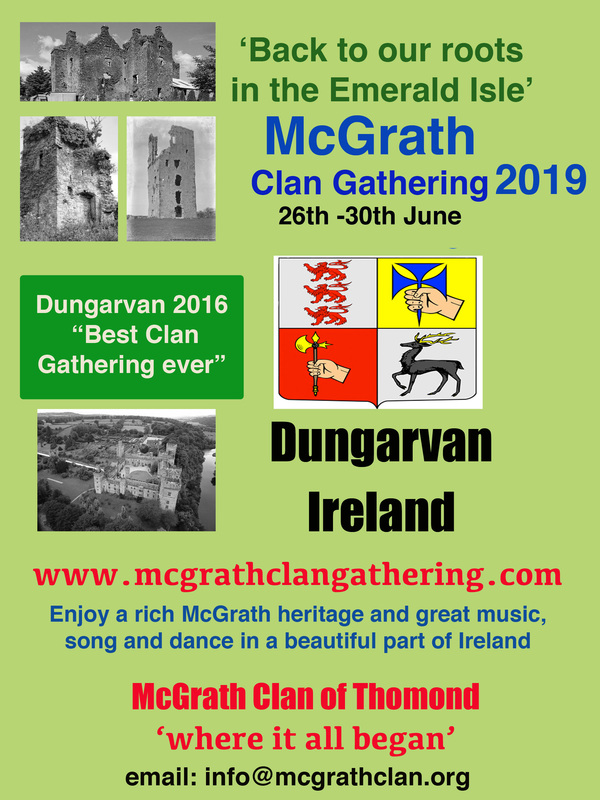 June 13th -16th Dungarvan, Co Waterford. ‘Meet & Greet’ night with some great Traditional Music. Registration Open 11am to 11.45am in the Park Hotel. Day Trip leaves from Park Hotel at 12 noon. Trip will travel via the Coast Road to Waterford and return via the Comeragh Mountains and Mahon Falls. It Includes a guided tour of the House of Waterford Crystal. Talks start at 10 am. Day Trip leaves from park Hotel at 12 noon. First stop will be a five minute photo opportunity at the Master McGrath monument. Next Stop will be at Sleady Castle, then onto Mountain Castle. Lismore Cathedral and the McGrath tomb is next, followed by some free time to explore Lismore and take photos at the beautiful Lismore Castle, which was once owned by the famous Bishop Miler McGrath. Then we will head for Helvic and the Gaelteacht. Clan Dinner at 8pm in Clonea Strand Hotel. This will be followed by a Traditional Music, Song and Dance show with Seamus Mac Craith as MC. Bus departs from town centre (The Local Bar) at 7.40pm for the Dinner. Bus Leaves Clonea at 11.30pm, for anyone who wishes to return to Dungarvan. 12 midnight, for the younger members of the Clan, Club Creation. Reduced price ticket are available. Mass at 12 Noon in Abbeyside Church. McGrath’s Castle stood only yards away from the Church and there’s a tomb to Donal McGrath behind the church at the entrance to the ruins of the previous church. Meeting in the bar of the Park Hotel for Lunch at 1pm. Golf Outing at 2pm at Gold Coast Golf Club. Free Time to shop or explore the area. Final Clan Gathering of weekend in Tigh an Cheoil at 8.30pm. Bus will depart Dungarvan ( THe Local Bar) at 8.15pm. This entry was posted in Uncategorized on June 10, 2013 by McGrath Clan (official).